Sam’s Hotel & Gambling Hall was the host site for Friday’s Mayweather Promotions card on ShoBox. The main event Featherweight Angelo “El Chinito” Leo of Las Vegas and Neil “The Beast” John Tabanao of the Cebu, Philippines. In the Main Event Featherweight Angelo “El Chinito” Leo, 17-0 (8), of Las Vegas, NV, defeated Neil “The Firey Lion” John Tabanao, 17-5(11), of Cebu City, PH, over 10 action rounds. In the first round after some feeling out at the halfway point both fighters opened up. Tabanao showed good hand speed while Leo more power in a good round for Leo. In the second round Leon countered a short jab landing a solid right to the chin. In the second round Leo kept up the pressure until Tabanao landed a right cross to the chin. It was a very competitive round but Leon seemed to pull it out. In the third round Tabanao landed a double jab but got countered by a Leo right to the chin. Leo was warned for a right border line low blow. In the fourth round Tabanao had Leo against the ropes but both were landing punches. Tabanao seemed to take the edge. In the fifth round referee Jay Nady again warned Leo for landing a punch low. In the final minute with both swinging wildly a left hook from Leo landed on the chin. In the sixth round a clash of heads caused Leo to have swelling over the right eye. In the final minute of the round Tabanao seemed to get the best of it. In the seventh round both boxers landed well. Leo landed a double left hook to to the chin. It was a good round for Leo. In the eighth round a Leo left hook knocked Tabanao’s head sideways. In the final fifteen seconds of the round Leo was landing half a dozen punches without return. In the ninth round Leo seemed to have his way. In the final minute Leo had Tabanao against the ropes landing well with little return from Tabanao. In the tenth and final round both fighters fought well with Leo seemingly wrapping up a win. Both boxers showed good portsmanship throughout. Scores were 100-89 and 100-90 twice. This writer had it 98-92. 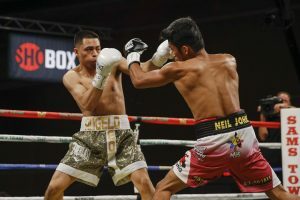 In the co-feature Super Featherweight Xavier Martinez, 14-0 (10), of Sacramento, CA, stopped John “Mulawin” Vincent Moralde, 21-3 (11), of General Santos City, PH, at 1:11 of the third round. In the first round Martinez landed the first non-jab with a right uppercut to the chin within 20 seconds of the round. Martinez kept coming forward looking for an early stoppage. Martinez landed a hard left hook to the chin driving Moralde half a dozen steps backwards into the ropes. Moralde seemed overwhelmed in the round. Martinez landed the last four punches of the round having Moralded pinned in a corner. In the second Martinez picked up where he left off landing many punches before a return from Moralde. Martinez rocked Moralde with a right cross on the chin. Moralde had taken so many punches the fight could be stopped in between rounds. Before the third round started referee Tony Weeks went to the Moralde corner and said he wasn’t going to allow him to take more punishment. Moralde had swelling around both eyes. A left on the chin from Martinez got there before Moralde’s left hook dropping Moralde. He got up in no condition but was allowed to take half a dozen more punches before referee weeks stopped it. Super Featherweight Andres Cortes, 11-0 (6), of Las Vegas, NV, defeated Jamal Dyer, 9-2 (5), of Baltimore, MD, over 8 rounds. The first two rounds were close with Dyer taking the first and Cortes the second. In the third round things picked up with more action with Dyer getting the better of it. In the fourth round Cortes landed a counter right on the chin. Dyer considering how hurt he was at the end of the previous round has done well to hold his own and suddenly a right on the chin from Dyer dropped Cortes. Cortes got up very angry taking it to Dyer to a slugfest to the bell. In the fifth round both fighters landed right uppercuts at the same time to the chin. With a minute left in the round Cortes landed several right hands to the chin. In round six Cortes landed a left to the body followed with a right to the head. Halfway through the round Cortes rocked Dyer with a right on the chin. In the seventh round Dyer backed Cortes up for the most part. Cortes had swelling under his right eye. It was a good round of action. In the eighth and final round it was close but Cortes seemed to get the better of it. Scores were 78-73, 79-73 and 78-74 while this writer had it 77-75 Cortes. Jay Nady was the referee. Welterweight Sanjarbek Rakhmanov, 11-2-1 (5), of UZB, out of Las Vegas, lost a split decision to Keith “The Bounty” Hunter, 10-0 (7), of Las Vegas, NV, over 8 rounds. Super Middleweight Kevin “The Second Coming” Newman II, 9-1-1 (5), of Las Vegas, knocked out Cesar “Principe” Lopez Ugarte, 8-4 (6), of Augascalientes, MEX, in the first round. Lightweight Kingdamon “Don’t Blink” Antoine, 9-0 (7), of Akron, OH, scored a shutout over Raheem Abdullah, 3-2 (0), of Colorado Springs, CO, over 6 rounds. Super Lightweight Maurice “Ambitious” Lee, 10-1-2 (5), of Woodland Hills, CA, defeated Andre Byrd, 7-6-2 (1), of Jacksonville, FL, over 6 rounds.